Photosynthesis is simply defined as, formation of carbohydrates from carbon dioxide and water by illuminated green cells of plants, oxygen and water being the by products". in other words, capture of photons of light by green plant cells and conversion of their radiant energy into chemical form of energy is called photosynthesis. 1. Chlorophyll a and Chlorophyll b pigments are involved largely and they are enclosed in the grana of the chloroplast. 2. Both PS I and PSII are involved. 3. Blue and red lights are used for photosynthesis. 4. H2O is used as the electron donor. During photolysis of water in light reaction, oxygen is liberated. 1. Bacteriochlorophyll is involved and they are enclosed in the thylakoids in cytoplasm. 2. Only PS I is involved. 3. Infrared light is used for photosynthesis. 4. Since H2O is not used as electron donar, no oxygen is produced. 5. 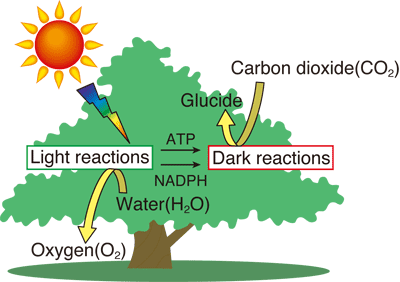 Here photosynthesis is somewhat exothermic (energy liberating).